A sleep Apnea test is a medical test conducted while you sleep at night. 1) Take a nap the day of the test. 2) Consume Caffeine within 6 hours prior to arrival time. 3) Consume Alcohol the day of the test. 4) Take non prescription medications which may cause drowsiness, unless directed to do so by your physician. treatment. After the paperwork, you will change into your sleep wear. 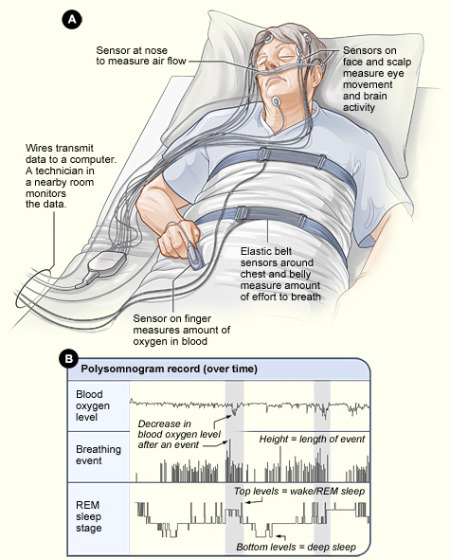 Before the sleep study can began, the Technician will apply several monitors to your body to monitor sleep functions. breathing sensor is taped to the area between the nose and upper lip to monitor your breathing and does not block your airways. Since we monitor your heart, we attach adhesive electrodes to your shoulders and one to the side of your chest. Two electrodes are taped to each leg to record all leg movement. You will have a cloth belt placed around your chest and abdomen to monitor your breathing. These belts are not restrictive and fit over your clothing. Finally, a band-aid type probe is wrapped around a finger to record the amount of oxygen in your blood. This setup is painless and you may watch television or read during the procedure. Before the sleep apnea study begins, the Technician will provide you with information regarding common sleep disorders and treatments. The study will start around 10:00pm-11:00pm and will last until 5:30am-7:30am. During the study, the door to your room will be closed and the lights and television turned off. You are not allow cell phones or pagers as this might disrupt your sleep. Your room is monitored with a video camera and a telcomm to allow communication between yourself and the Tech. up visit with your physician.